Become a Member | Visit Butler County Pennsylvania! When you become a member of Butler County Tourism & Convention Bureau (BCTCB), you become part of a county-wide initiative that promotes your business. 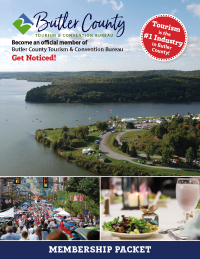 Funded by a 5% bed tax collected by hotels, motels, B&Bs and cabins, the Bureau works to make Butler County, PA an appealing destination for tourists, event planners and meeting planners. Our mission is to promote Butler County as an attractive tourism and business destination. BCTCB members can participate in cooperative advertising which helps stretch your marketing dollars. In addition, the Bureau contracts with various publications, radio, TV, billboard and online media for advertising. Using budgeted Bureau funds allows individuals and groups to combine resources for ad placement. ​BCTCB has strong PR connections. The Bureau is ​represented in MATPRA, the Mid-Atlantic Tourism Public Relations Alliance. Monthly, events are sent to local media and information is submitted to VisitPA in accordance with their editorial calendar. The Bureau also conducts tours for writers, and other media outreach is conducted to support members when applicable. To keep members well-informed about what BCTCB is doing, a variety of communication tools exist. As a member, you will receive frequent emails, have access to a members-only section of the website, get a monthly e-newsletter, and have opportunities to attend monthly board meetings and quarterly membership meetings. BCTCB’s toll free number, 866-856-8444, enables tourists throughout the United States and Canada to contact us free of charge and is listed in all BCTCB advertisements. BCTCB participates in regional marketing initiatives designed to attract visitors from across the US and Canada. BCTCB promotes its members to the group tour market. A group sales committee creates packages, itineraries and special offers to entice groups to the area. As a BCTCB member, you will have opportunities to meet and network with other members as well as travel and tourism leaders. BCTCB staff represents the Bureau and its members at a wide variety of fairs, expos, festivals, conferences, luncheons and speaking engagements throughout the year. Special webpages are created to feature holiday sales, events and other promotions. This gives members more opportunities for additional exposure. Members are given the opportunity to include their materials in our office brochure rack. We ask for approximately 250 brochures so visitors may pick them up or request a mailing. BCTCB also offers a Brochure Rack Program. For $50 per year, we’ll add your brochures to a portion of our county-wide racks. To start, 2,500 brochures are needed. Contact us for availability and specific details. A grant program enables members to apply for monies to implement a project or improvement. Funds are awarded once a year and applications are available on the members-only section of the website. Grants require a 25% match and membership for at least one year before applying. BCTCB bylaws qualify tourism-based industries as businesses that fall into the following categories. Each category has one representative on the board of directors. We also welcome businesses as Supporting Members who believe in our mission. Members are asked to provide support through annual dues, voting, and participation in meetings and other relevant activities. In addition, professional conduct through good customer service, ethical business practices and clean, well-maintained facilities are expected. The board of directors is responsible for approving all memberships. Includes all Standard membership benefits. A 501-C3 or equivalent form is required to document status. Please include it with your application. Includes all Standard membership benefits. Exclusive benefits as negotiated with BCTCB. A partnership package will be individually tailored to suit the needs and mission of your company or organization. Based on availability, the Bureau will distribute standard tri-fold tourism-based brochures in racks throughout the county. At least 2,500 brochures are required to initiate the program. Members having more than one location in the county can add additional listings for each location in the visitors guide and on the website. If a business has a different name it will be considered a separate member at the $215 rate. Membership dues are renewed annually on your anniversary date. The Tourism Bureau's marketing efforts for the BlueSox certainly was a positive factor in shattering the Regular Season attendance record in 2017. Needless to say, our organization appreciates all of your efforts.